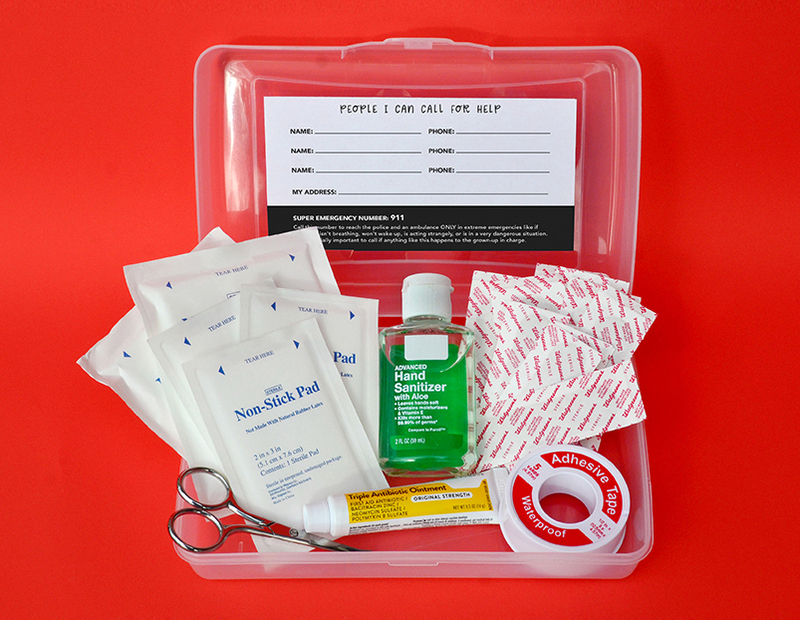 We’ve outlined the basic first-aid steps for handling minor injuries below, including a list of what kids need to stock their very own first-aid kit. Review the steps with your child—who knows, you might just have a future doctor on your hands! 1. Apply gentle pressure to the wound with a clean cloth or tissue. 2. Wash under cool running water when the bleeding stops. If there’s visible dirt, add a little soap and rinse well. Gently pat dry. 3. Unwrap an adhesive bandage and squeeze antibiotic ointment on the pad. 4. Apply the bandage snugly. 3. Cover it loosely with a bandage. 1. Wrap an ice pack in a towel, and apply it to the bump for 10 minutes. Use a ziptop bag with ice or even frozen peas! 3. Reapply the cold pack for 10 minutes every hour or so for 24 hours.